If you’re going to ask a speaker to come to said NJLA Podcasting Station, it’s best to be prepared, or they might just walk away! If you go to a luncheon at Ocean Place, don’t order the vegetarian meal (or so I heard). While at Computers in Libraries this year I gave two CyberTours and one presentation. This is just a quick post that will be edited very soon with more details. I just want to get the slides up here before speaking at the NJLA conference tomorrow. I am demonstrating SlideShare, a new addition to our Fantastic Freebies portfolio — one I learned about at CIL07! It’s that time of year: The NJLA Conference! The conference is one of my very favorite things! Last year was the first year that I found myself “behind the scenes” and I had the best time! I experienced the conference in a completely different way and got just as much, though different, things out of it! I had attended a few years prior to that strictly as an “attendee,” but last year, due to my involvement on the NJLA Information Technologies Section, and the NJLA Member Services Committee, I found myself much more involved. I spent a lot of time welcoming people at the Hospitality Table – boy, that was fun! And a lot of time at the Podcasting Station, which was also fun and very exciting! I hope you’ll stop by either one of those places, or both, if you’re coming to conference…. 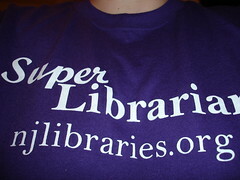 I’ll also be blogging the conference here for NJLA (really, I WILL! Which I intend to use to get back into blogging and stop being so lame!) so check it out! Really! Of course, the IT and YA Programs, particularly Cool Tools and Just Push Play! with Steve Garwood; Let’s Mambo at the Library, with Robert P. Rynkiewicz; and Harness the power of Social Software @ Your Library, with Liz Burns and Sophie Brookover! Our own Janie L. Hermann will be presenting 15 Fantastic Freebies in 50 Minutes, which I’m sure is going to be packed! And, especially the Helen Blowers presentations, Core Competencies, Core Values in the Era of Library 2.0 and Discovering Library 2.0 (Can you tell I’m a little bit tech-oriented!?)! Gosh, I hope I can get to everything! That is usually the only criticism I hear and feel about the conference – too many good programs competing against each other in the same time slots! One more invite: Lynn Schott and I will be hosting “Lunch Buddies” again at the conference – if you want people to eat lunch with, we’ll be gathering people at the Hospitality Table – so come see us!